Password Safe is a database for encrypting sensitive information. Once opened with a master password, you can copy a password and paste it directly into your application. Alternatively, Password Safe supports "Auto Type" that enters the username and password into the target application by simulating keystrokes. The database is encrypted using the Twofish encryption algorithm. A Linux version (currently in Beta) is also available from the website. Alternatively, X-Password Safe and Password Safe Portable are stealth. Stealth: ? No. Creates a folder in %LocalAppData% and %UserProfile%\My Documents. "PasswordSafe's official website is now at https://pwsafe.org/ "
MultiObfuscator is a feature-rich crytography tool with seeded random number generator, deniable cryptography, 256 meg of secret file or 256k of secret text (text/email mode), multiple algorithms, data obfuscation, and steganalysis resistance. Includes unique layers of security and obfuscation with 256bit+256bit symmetric-key cryptography with KDF4 password extension, 256bit symmetric-key data scrambling (CSPRNG-based shuffling), 256bit symmetric-key data whitening (CSPRNG-based noise mixing), and adaptive X-square correction. How to extract: Download the ZIP package and extract to a folder of your choice. Launch MultiObfuscator.exe. Cosimo, shouldn't you admit that the actual file limit is only 64Mb in the lowest Noise/Data ratio (300%). The actual text limit is a limited 46k in the same Noise/Data ratio. That mean's a 64Mb file automatically grows 4 times bigger and there's nothing you can you about it! A 46k text file grows over 5 fatter! What good it that? I tested version 2.00 of this bizarre software. It doesn't look any better. It certainly hasn't performed any better. Still the same old bad limitations. I would not recommend this software. OpenPuff is a advanced watermarking and Steganography, or data hiding, program capable of storing up to 256MB of encrypted data using an invisible copyright mark in pictures, video, audio, and flash files. 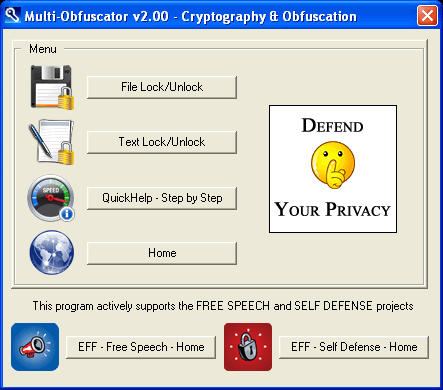 Uses a variety of modern encryption algorithms. How to extract: Download the ZIP package and extract to a folder of your choice. Launch OpenPuff.exe. The download link is broken, check please. Thanks MOR. Fortunecity doesn't allow direct linking.